September 14 is near and “The One” will stand out hopefully without controversy. I am not sure who will be favored by the politics if it comes to that. Floyd was never a KO artist and after moving up in weight he did not bring his punch with him. Saul Alvarez knocking out Floyd Mayweather is not a scenario that pundits would even consider although „Canelo“ seems to hit hard enough. The outcome will probably depend on the judges. There are labels for matching up different styles like “a boxer vs. a puncher“, “a stylist vs. a brawler“, if I had to label the fight I’d say “a boxer vs. a fighter” but there would be a lot of “fine print“ under that label. Floyd Mayweather‘s style is unconventional for the pro ranks as it is fundamentally based on the Olympic/amateur boxing style. His amateur boxing skills have been optimized and modified for prize fighting. He has made countless adjustments but essentially he is a pragmatic efficient amateur. He has removed some risky and energy-consuming drills and routines but he carried over a lot of skills directly and that was a wise decision. Whether he realizes it or not, he upholds and validates the amateur boxing style. He could be reproached for his tactics of jab-hold the head and arm, right hand lead-clinch; grab and hold briefly, tie up and wrestle away then circle and roll the shoulder, but he makes it work. If he can avoid exchanging at close range and then proceed to the comfortable middle and long range, he has a great inside game. Short range is a jealous lover; even if you prevail you still get tagged a lot. It affects career length as excessive jealousy affects the length of a relationship. If FMJ can punch above welter weight, he keeps it a secret. He only throws single scoring shots with extreme caution and immediately evacuates. His wide stance with feet well apart is a direct import from the amateur days, it increases his range and balance in defense and offense. His spectacular defense defines him as a boxer especially after he moved up in weight. It is an all-around affair and he uses foot work, body movement, hand defenses and tie-up-smother tactics. One major weakness is that a defensive master like him keeps his head high and the chin UP. Not blatantly up but still indecently high for his stellar status. When he throws a left hook, he lifts the chin even higher and to the right. His defense relies on reflex, speed and anticipation. Timing cuts both ways, it helps defense even more. Those are intangible qualities that fade imperceptibly with time and the average age when substantial changes occur is 32-34 years. Mayweather is 36 and it is a matter of time before he „grows old overnight“ within a tough fight. Saul “:Canelo” Alvarez has youth on his side and perhaps surpasses Mayweather in single punch power. The main difference is in the way they deliver their shots at the point of contact. 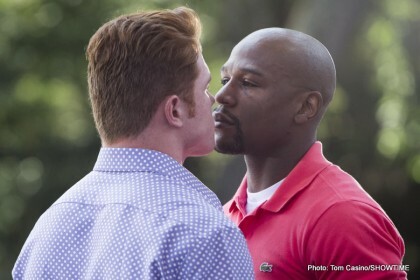 There is a different type of momentum in their fists, Floyd is a conservative score-and-run artist while Canelo intends immediate bodily harm. Floyd is prepared to chip away for 12 rounds, Alvarez tries to go home early. Hand speed is hard to compare due to the difference in execution but it seems adequate for both. One element that is being overlooked is Canelo’s jab which is a sharp tool. For example it “rinsed” Trout’s head several times and precipitated the knock down. When a jab sends the shiny drops of sweat flying in the spot light, that’s a jab with a snap and such a jab sometimes has the effect of a power punch. Alvarez’s defense is very reliable as well but it’s of a different type. It’s a pro-active, offense oriented shield that uses much more slips, dips, ducks, rolls, head movement and it’s meant to free up the hands for punching back. It is a stationary “I’m not backing down” macho setup, hence the ostensible impression that Alvarez is flat-footed. He knows his way around the ring and he will find Floyd. I dare say he might even find him out. I am inclined to pick Alvarez to win mainly because of his youth. On the other hand both boxers are a good alibi for each other, whoever loses can point age as an excuse. Time flies in boxing after you turn 32. One could claim wear and tear, the “greener” one – lack of experience. Floyd could also rightfully blame the weight disadvantage. Weight and youth influenced my choice but it is emotionally impartial. I am a fan of boxing before I am a fan of a boxer and none of these two fine boxers would make my day by winning or losing. They could make my day if they do their best and fight from the heart. Previous boxing news: Award Winning Artist Commissioned to Create Artwork for Mayweather vs Canelo Superfight!